Disney Diary - Week 15. A California Republic flag and an Australian flag. For those of you wondering what the hell this is, this is a portrait of Grand Meow. My roommate Josh's Grandfather's cat. Who watches over us and keeps us from harms way. In other words, I moved into an apartment full of weirdos and crazies who have no TV. But they are just as nice as my former roommates. When I moved in, I did have the opportunity to meet my new roommates. They were all out at work or other places. I finally met them in the following days. I first met Kedrick Carter, a student nurse from San Diego, California, and Shane, a Photographer from Pittsburgh, Pennsylvania. In the following days, I met Josh Tate, from Florida, Perkins, a.k.a. 'Cruzin'', from Milwaukee, Wisconsin, and Harley Vanderkolk, an actor turned computer science major from Brisbane, Australia. So far, the boys and I have been getting along and living together under one roof. It is unfortunate however that Josh, Kedrick and Shane are moving out in two weeks once their program is ending on May 15th. Well, I must say that it was a pleasure knowing them while it lasted. When they do move out, I wish them all the best for the future. But it is not all bad, after all, Cruizin' and Harley will be staying and we will still be together in this apartment - hopefully. Film Review: "Ex Machina" (2015). "What happens to me if I fail your test?" This is the question asked in Ex Machina. This British science fiction psychological thriller film written and directed by Alex Garland in his directorial debut. The film centres on Caleb, a 26 year old coder at the world's largest internet company, wins a competition to spend a week at a private mountain retreat belonging to Nathan, the reclusive CEO of the company. But when Caleb arrives at the remote location he finds that he will have to participate in a strange and fascinating experiment in which he must interact with the world's first true artificial intelligence, housed in the body of a beautiful robot girl. The foundation for Ex Machina was laid when Garland was 11 or 12 years old, after he had done some basic coding and experimentation on a computer his parents had bought him and which he sometimes felt had a mind of its own. His later ideas came from years of discussions he had been having with a friend with an expertise in neuroscience, who claimed machines could never become sentient. Trying to find an answer on his own he started reading books on the topic. During the pre-production of Dredd (2012), while going through a book by Murray Shanahan about consciousness and embodiment, Garland had an "epiphany". The idea was written down and put aside till later. Shanahan, along with Adam Rutherford, became a consultant for the film, and the ISBN of his book is referred to as an easter egg in the film. Other inspirations came from films like Stanley Kubrick's 2001: A Space Odyssey (1968), Ken Russell's Altered States (1980), and books written by Ludwig Wittgenstein, Ray Kurzweil and others. Wanting total creative freedom, without having to add conventional action sequences, he made the film on as small a budget as possible. The film was shot over six weeks in 2013 at Pinewood Studios and at Juvet Landscape Hotel in Valldalen, Norway. To create Ava's robotic features, they filmed the scenes both with and without actress Alicia Vikander's presence, which allowed them to capture the background behind her. The parts they wanted to keep, especially her hands and face, were then rotoscoped while the rest was digitally painted out and the background behind her restored. Camera- and body-tracking systems transferred Vikander's performance to the CGI robot's movements. In total, there were about 800 VFX shots, of which 350 or so were robot shots. It stars Domhnall Gleeson, Alicia Vikander, Oscar Isaac and Sonoya Mizuno. The cast gave superb performances. Vikander, out of the cast, gave the best performance as she brought a performance of otherworldly entity unlike any other. Ex Machina proves an audacious directorial debut for writer Alex Garland and a solid entry in modern British sci-fi, with thematic heft to match its genre thrills. It's a brooding, stylish, highly atmospheric future-noir thriller. As well as being a smart, thought-provoking little thriller. Brimming with ideas and laudable ambition, it's well worth a look. It may not look like much but it's a lot of fun once you get in there and it's great for cardio. I never had that much cardio work in my life. It was the most exercise I had in a while. Before I conclude, there is one more note. On a completely unrelated topic, I had received an email from Disney that I have been accepted for extension in the Disney International programs. What does this mean you ask? It simply means that I will be staying for a whole year until January 2016, once I accept the offer. So expect for Disney diary entries to come. Film Review: "Furious 7" (2015). "I used to say I live my life a quarter mile at a time and I think that's why we were brothers - because you did too. No matter where you are... you'll always be with me. And you'll always be my brother." This is sadly at the heart of Furious 7. This action film directed by James Wan and written by Chris Morgan. 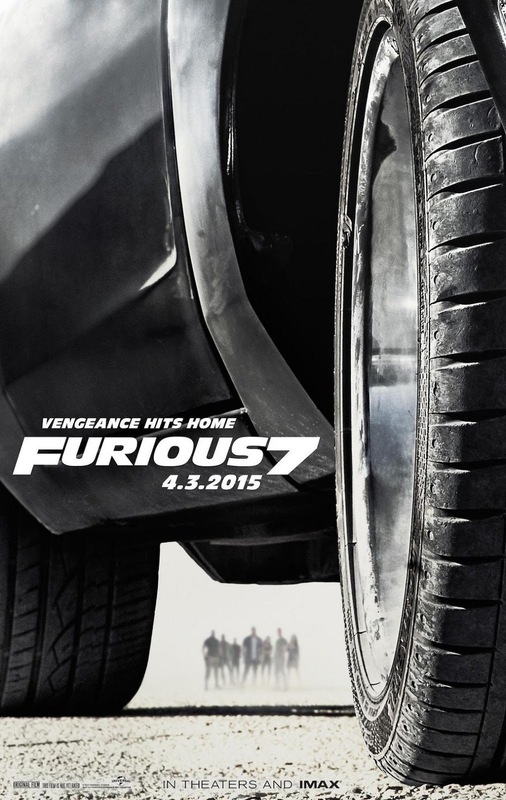 It is the seventh installment in the Fast and the Furious franchise. Furious 7 follows Dominic, Brian and the rest of their team, who have returned to the United States to live normal lives after securing amnesty for their past crimes in Fast & Furious 6 (2013), until Deckard Shaw, a rogue special forces assassin seeking to avenge his comatose younger brother, puts them in danger once again. In October 2011, the Los Angeles Times reported that Universal Studios was considering filming two sequels to the Fast and the Furious franchise shot back-to-back with a single storyline running through both films. Both would be written by Chris Morgan and directed by Justin Lin. In December 2011, following the release of Fast Five, Vin Diesel stated that Fast Six would be split into two parts, with writing for the two films occurring simultaneously. However, in an interview in February 2012, Dwayne Johnson stated that this idea was scrapped and that production on Fast Seven would only begin after the completion of Fast Six. In April 2013, Lin announced that he would not return to direct a seventh film. In April 2013, Australian director James Wan, predominantly known for horror films, was announced as the sequel's director. In April 2013, Diesel announced that the sequel would be released on July 11, 2014. In May 2013, Diesel said that the sequel would feature Los Angeles, Tokyo and the Middle East as locations. Principal photography began in early September 2013, shooting in Atlanta, Georgia; Dubai, United Arab Emirates; Colorado and Oakland. Production on the film was halted on December 1, 2013 following the tragic death of Paul Walker, who was killed in a car crash on November 30, 2013. Shooting had been underway in Atlanta and the film was scheduled to be released on July 11, 2014. Wan and Universal executives held a conference call to determine how to proceed with the production in a manner respectful to Walker's memory. Walker was nearly halfway through filming at the time of his death. Although there was some consideration about scrapping the film altogether, the film eventually resumed productions following rewrites to address Walker's absence and give his character a proper send-off. Body doubles, stunt doubles, and CGI were used to complete Walker's scenes. Walker's brothers Caleb Walker and Cody Walker were among the doubles, and also provided voice over for the character Brian O'Conner. The film stars Vin Diesel, Paul Walker, Dwayne Johnson, Michelle Rodriguez, Tyrese Gibson, Chris 'Ludacris' Bridges, Jordana Brewster, Kurt Russell, and Jason Statham. The cast gave terrific performances, none more so than the late Paul Walker. Here we witnessed the best performance of his career and he will be forever missed by his legions of loyal fans. May he rest in peace. With high-octane action and a touching send off to the late Paul Walker, Furious 7 accelerates than the previous instalments combined. Also, see my review for The Conjuring.